"The 8th Habit: From Effectiveness to Greatness is a book written by Stephen R. Covey, published in 2004. It is an upgrade of The Seven Habits of Highly Effective People, first published in 1989. As such, it clarifies and reinforces Covey's earlier declaration that "Interdependence is a higher value than independence." The eighth habit is "Find your voice and inspire others to find theirs." 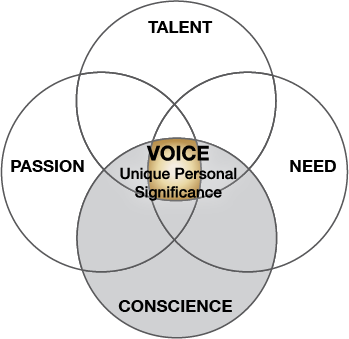 Voice is Covey's code for "unique personal significance." Those who inspire others to find theirs are the leaders needed now and for the future, according to Covey." The four intelligences – mental, physical, emotional and spiritual.